CJPP supports the global movement for a campaign of Boycott, Divestment and Sanctions (BDS) against Israel until it complies with international law and Palestinian rights. This campaign was initiated by Palestinian civil society in 2005 and CJPP has supported this strategy since it was founded in 2006. 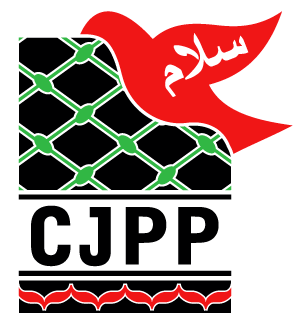 Building and strengthening a global BDS movement has become a core aim for many involved in todays solidarity work for Palestine, including CJPP. More than 350 European human rights organizations, trade unions, church groups and political parties, some of whom have not yet endorsed BDS, have called on the European Union to support the right to boycott Israel in response to its occupation and violations of Palestinian rights. Similar statements have been made by Amnesty International and Human Rights Watch. Boycotts can be consumer, sporting, cultural or academic. Boycotts are an tool in the overall BDS strategy because they generate increased media coverage for the issue, they generate public discussion and debate, allowing opportunities to educate and provide better knowledge and understanding of the situation facing Palestinian people. Boycotts make it clear that Israel’s actions and in particular, its blatant disregard of the norms of international law, is not acceptable. The success of boycotts must be measured against these criteria more than against any economic impact. Jaffa and Carmel brands citrus from Israel. Labels on Jaffa and Carmel grapefruit are often misleading as this produce is from Israel despite supermarket labeling them Product of Australia. Israeli Dead Sea Products AHAVA cosmetics are manufactured in the illegal Mitzpe Shalem settlement. Ahava uses Palestinian natural resources from the Dead Sea without permission or compensation to Palestinians. Seacret and other Israeli owned Dead Sea mud cosmetic companies all benefit from the illegal occupation of Palestine. Bin Veolia Australia Veolia has finally ended its involvement with the Israeli Occupation after intense international pressure from BDS groups over many years. Reject Elbit the Israeli arms company has provided $10 million towards a flight simulator that will be located in NSW as part of the Royal Flying Doctor Service. CJPP is working with other BDS groups in Australia to pressure the RFDS to withdraw from this association with Elbit. Academic and cultural boycotts of Israel send a powerful message that the state of Israel is not ‘normal’ and that state sponsored arts organisations or, artists or academics who are state sponsored should be boycotted. Artists and academics from the West who choose to perform in Israel are doing so despite the call from Palestinian civil society not to normalize this apartheid state and its ongoing dispossession of Palestinian land and rights. Numerous high profile artists have refused to tour in Israel as a result of pressure from the BDS movement, including most recently, Australian singer Natalie Imbruglia. A sporting boycott of Israel sends a powerful message that its policy of occupation, expulsion and racism against Palestinians is unacceptable. As part of the global BDS movement, we believe it is important to call out Israel for promoting itself as a fair player via the participation of its sporting teams and individuals in international and bilateral competitions. Sporting boycotts are a powerful tool in raising public awareness about discrimination and occupation of Palestinians just as our sporting boycotts were a powerful tool in fighting South African apartheid. Palestinian sporting teams and individuals are frequently denied travel approval to attend international sporting events. Individual sportspeople are targeted frequently by the Israeli Occupation Forces. Exclude Israel from sporting events and within global competitions such as the World Cup and the Olympics. Promote Palestinian presence and the right of participation in international sporting events supporting Palestinian identity and self-determination. Divestment (or disinvestment) means targeting companies/corporations which are complicit in the Israeli Occupation and ensuring that investments funds, such as university investments or superannuation/pension funds, are not invested in such companies. The BDS movement has had a significant victory regarding international divestment campaigns aimed at the French multinational company Veolia. International campaigns continue against the multinational security company G4S, Caterpillar,Motorola Solutions, Hewlett Packard and many others for their complicity in the ongoing Occupation, dispossession and violations of human rights against Palestinians. Developing awareness that local communities are part of wider state-based, national and international communities. In Australia, Marrickville Council in NSW made history as the first Australian council to pass a comprehensive resolution in support of BDS in December 2010. Excessive commentary from ill-informed media outlets and ALP government and Liberal Opposition state and federal politicians, saw extraordinary pressure exerted on Councillors to rescind their decision in April 2011. However, Marrickville Council maintained its support of all the tenets of the BDS movement along with continuing its sister city relationship with Bethlehem. The Marrickville Council saga put BDS firmly on the political map in Australia. Letters were sent to Marrickville Councillors from councillors in England, Scotland, Spain and Sweden offering support for the Marrickville stand on BDS and Bishop Desmond Tutu sent a personal letter of support to all Councillors commending them for their stance. Around the world, numerous local councils are taking up boycott of Israel as a tool to signal their dissatisfaction with Israel’s abuse of human rights and rule of law in its treatment of the Palestinian people. The UK high court recently ruled that boycotts by local councils are legal. Iceland’s capital city votes to boycott Israel as long as the Occupation of Palestinian territories continues. CJPP encourages Australian councils to explore ways of incorporating support for social justice and human rights into their operating policies. Sanctions are an essential method of demonstrating disapproval of a country’s actions. Sanctions may be implemented at a state, regional or institutional level. International sanctions are imposed where the UN Security Council (UNSC) has determined the existence of a threat to the peace, breach of the peace, or an act of aggression. The UN can decide on measures to be taken to maintain or restore international peace and security. Members of the United Nations are then legally bound to accept and carry out these measures. Those measures that do not involve the use of armed force are known as sanctions and can encompass military, trade and diplomatic ties. The Australian Government also has the option to impose its own autonomous sanctions against another state (outside of those measures the Government is obliged to take by virtue of a UNSC resolution). Autonomous sanctions are an independent foreign policy response to situations of international concern. Autonomous sanctions are punitive measures not involving the use of armed force that the Australian Government chooses to take to apply pressure on other states to desist in the repression of human rights and democratic freedoms, or the pursuit of internationally or regionally destabilising policies (such as WMD proliferation), or to prevent regime leaders using Australia as a haven for misappropriated state or other funds. Currently, Australia subjects the countries of Syria, Burma (Myanmar), Fiji, Iran, North Korea, the former Federal Republic of Yugoslavia and Zimbabwe to autonomous sanctions. Israel is a country in breach of almost all of its obligations under international law. Sanctions were the final blow to the apartheid regime in South Africa, and given the dependency of Israel upon global markets, sanctions at a state, regional or institutional level will be a highly effective measure to bring about real pressure. Israel’s membership in or association with various diplomatic and economic forums, such as the United Nations, EU and OECD, provides an unwarranted veneer of respectability and material support for its crimes. Free trade agreements with Israel play a key role in normalizing and whitewashing Israel’s crimes and in emboldening its impunity. By calling for sanctions against Israel, campaigners educate society about Israel’s violations of international law and seek to end the complicity of international institutions and other states in these violations. The main issue regarding sanctions is that action rests on states and global institutions, many of whom have a long history of supporting or implementing colonialism and occupations in the Middle East. However more recently, several states have engaged in measures that may be considered first steps towards sanctions. The decision by many OECD member countries to boycott an OECD tourism conference or efforts targeting Israel’s involvement in the European Union such as the call for sanctions from 26 ex-EU leaders are two examples. military links, including partnerships, agreements and joint operations; Currently CJPP supports the NSW Greens for Palestine campaign to End All Military Ties with Israel. diplomatic links, including relations on an official level, participation in international institutions, external forums and networks and meetings between state representatives.